The appreciation and pleasure we derive from observing anything beautiful is a basic aspect of human nature.Your smile is a fundamental element of your natural beauty. A healthy, attractive smile is an important facet of life; it impacts your self-esteem and overall well-being, in addition to your personal, social, and professional relationships. When you are pleased with your appearance, you radiate confidence. 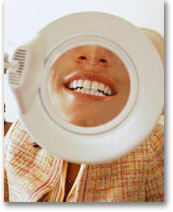 At Parkside Dental Health our goal is to help you enhance your smile and thus enhance your life. Each newly designed smile is a work of art that is created with a combination of clinical expertise, artistic talent, attention to detail, and your specific desires. Your smile should be suitable to your face and personality so it appears perfectly natural. Do your front teeth have discolored fillings? Do your teeth look worn, flat or sharp? Do your back teeth look gray or black due to silver/mercury fillings? Do you have a “gummy” smile? Are your gums healthy and pink in color or are they red and inflamed? Do you find yourself not smiling in photos or covering your teeth with your hand? If you are considering enhancing your smile and want to learn more about various aesthetic options, contact our office for a cosmetic consultation. We look forward to giving you more reasons to smile.